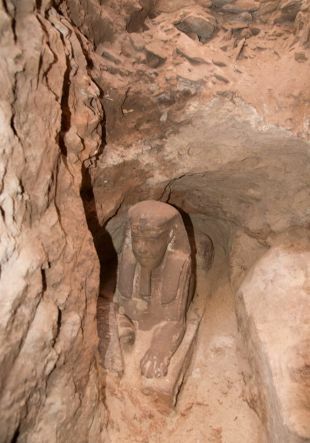 Another sphinx has been found in Egypt by archaeologists draining groundwater buildup from a temple in the southern city of Aswan, Reuters reported Monday. The newfound sphinx is a titch but is impressively preserved, given its rescue from inundation. Hardly monumental like the sphinx of fame on the Giza plateau, the Aswan temple sphinx is about a foot wide and less than two feet tall. 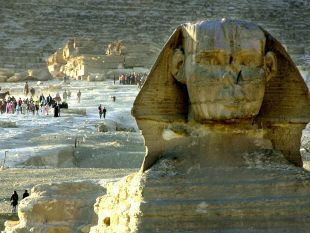 The Giza sphinx, or what remains of it, is 20 meters tall, 19 meters wide and 73 meters in length. While the Giza giant has been eroded by time, the small sphinx was in good condition despite also being made of soft sandstone and apparently dating back around 2,000 years: Unlike the Giza giant, it spent the millennia indoors. The face and carved jewelry of the mythological monster can still be clearly seen. The new sphinx statue was found at the site of the Kom Ombo temple, famed mainly for – unusually – being devoted to two gods, not one. Its southern part was dedicated to the crocodile god Sobek, who created the world with the goddess Hathor and the moon god Khonsu, according to ancient Egyptian legend. Kom Ombo's northern part was dedicated to the falcon god Horus, or Haroeris, who was an aspect of Hathor (an Egyptian goddess that some suspect originated in Canaan). 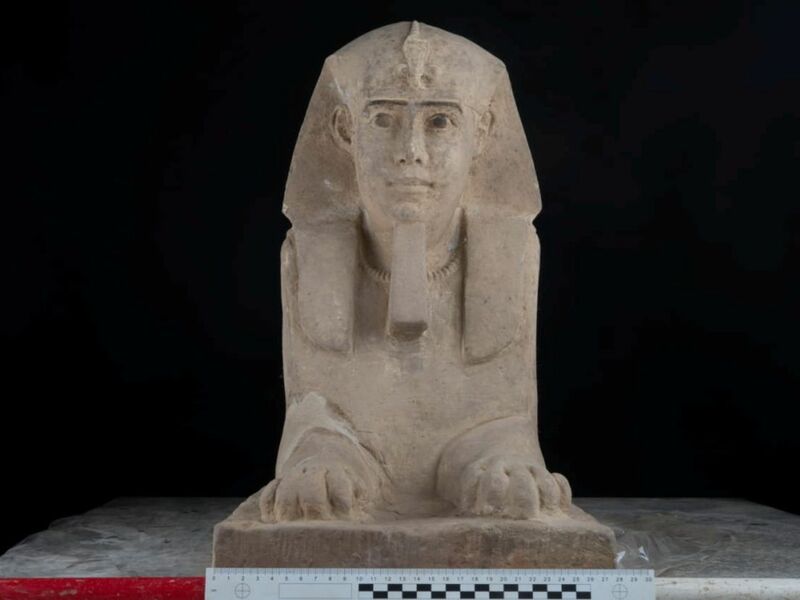 Given that the Kom Ombo temple is believed to have been built during the Ptolemaic period of control over Egypt, the newly found sphinx is also believed to date from that time. Two engraved sandstone reliefs of Pharaoh Ptolemy V Epiphanes had also recently been found at the same site, Egypt's Antiquities Ministry said. The face on Aswan sphinx looks both young and benign, but the personality of sphinx imagery itself is a mixed bag. 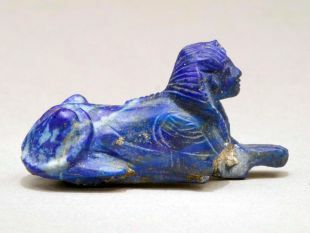 Despite its association with ancient Egypt, the sphinx imagery may have originated in prehistoric southern Turkey, going back to the dawn of modern civilization. The earliest sphinx statue, crude but sort of recognizable, was reported from the archaeological dig at Nevali Cori, and has been roughly dated to around 9,500 years of age. 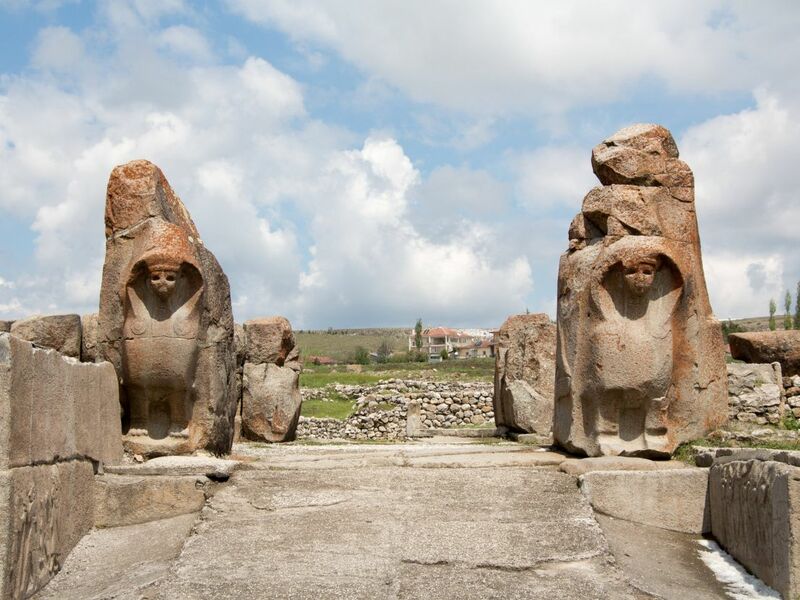 Nevali Cori is near Gobekli Tepe, the site famed the "earliest temple in the world". Depending which later civilization was appropriating it, the sphinx could be male or female, vicious and treacherous, or noble. All depicted it as having the body of a lion and head of a person, and the ancient Greeks decided it also had wings. Grecian myth has the sphinx as a merciless female that eats fools who cannot answer its riddle. Egyptian sphinxes were more benign males, but they were thought to be immensely strong, hence their positions as temple guards. The Ptolemaic dynasty hailed from Macedonia and ruled Egypt during the Hellenistic period, after the death of Alexander the Great in 323 BCE. The dynasty ended with the death of Cleopatra and Roman conquest in 30 C.E. the first Ptolemy to seize the scepter was Ptolemy I Soter, in 305 B.C.E., who declared himself pharaoh and made his capital in the seaside city of Alexandria. To cement their imported rule, among other things the Ptolemies were meticulous about adopting local habits, including marrying their sisters, for the sake of local legitimacy. The pharaoh depicted in the temple statuary, Ptolemy V, was son of Ptolemy IV from an Egyptian noblewoman. He assumed the throne at the age of five, in 204 B.C.E., when his father died and his mother was murdered. He would rule until 181 B.C.E. and made himself a reputation as a cruel, mendacious regent. Ultimately Ptolemaic rule spanned about three centuries until the Roman conquest in 30 BC. Another monumental sphinx, or rather part of one, was even found in Israel in 2013, in the ancient city of Hazor, which had been quite the wealthy polis. Dating back to centuries before the Ptolemaic sphinx, the Hazor one bears a hieroglyph naming Mycerinus, who ruled Egypt about 3,400 years ago and was one of the builders of the Giza pyramids, where the huge sphinx sits. The statue is the only surviving sphinx of King Mycerinus: none have been found even in Egypt itself.